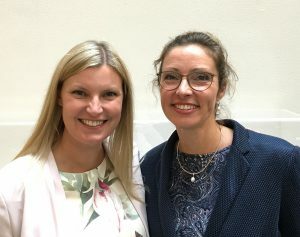 Sabine Reinfeldt is awarded the newly established prize in medical technology, in the spirit of Henry Wallman, for her research on bone conduction, and for her ability to build bridges between disciplines. 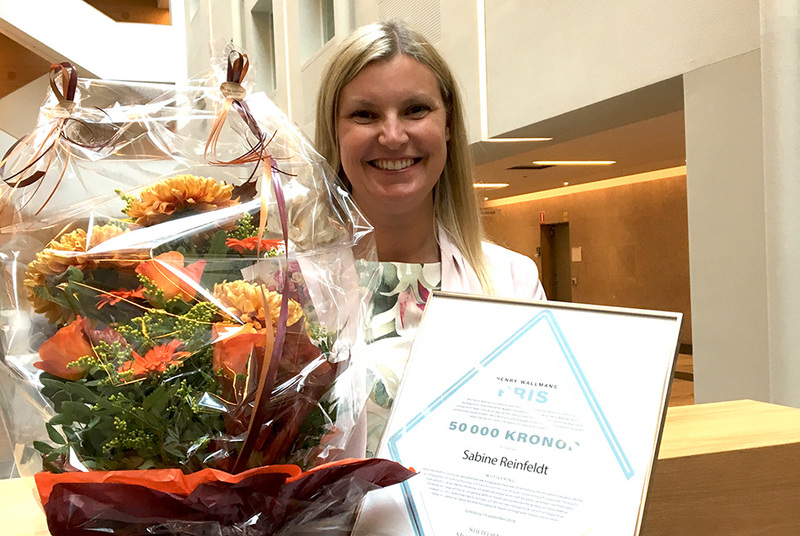 Sabine, Associate Professor and leader of the research group Biomedical Signals and Systems at Chalmers University of Technology, received the prize at a ceremony arranged by MedTech West on 19 September , 2018. 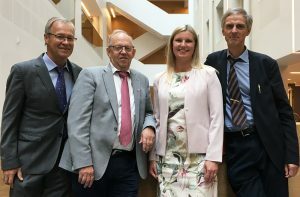 Sabine with (from the left) her former supervisor Professor Bo Håkansson, and Professor Bengt-Arne Sjöqvist and Professor Kaj Lindecrantz, both from the Foundation of Medicin & Teknik at Chalmers. You receive the prize also for your great ability to build bridges between disciplines. Why is cooperation a success factor in research, and what is the key to build well-functioning multidisciplinary teams? – We need to realize that within one discipline, we would never be able to solve the challenges in society, for example in healthcare. We need to cooperate over disciplines to complement each other with our different backgrounds. It is essential to listen to each other’s experiences and knowledge, and to be open minded for new solutions. To develop medical devices that are safe and effective for the patients would never be possible without multidisciplinary collaboration. In my opinion, the key to build well-functioning multidisciplinary teams is to include highly motivated people who all have a passion for solving the same problem. Commitment is one key, and that the team members listen to the others. It is necessary to respect the other disciplines and the fact that they have knowledge that complement your own. 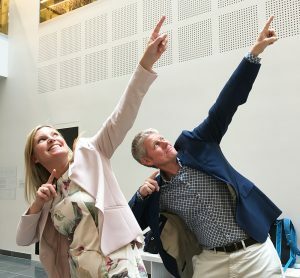 Sabine and Måns Eeg-Olofsson, specialist in ENT and Audiology at Sahlgrenska University Hospital jointly presented their research on hearing implant, where functionally deaf patients can gain normal hearing with a Bone Conduction Implant (BCI). Which is the next step in your research? – In our multicenter clinical study of the Bone Conducting Implant (BCI), we have 16 patients with hearing impairment, who have had the implant between nearly two and six years now. In extensive measurements, we are following up their performance in for example audiometric and electrical transmission tests, and we are now in the middle of several three-year and five-year visits. There are still areas involving these patients to be investigated, for example in directional hearing. Are there differences between different types of bone conduction devices? Also, could the attachment and size of the implant affect the outcome? In an adjacent field, which we are now moving into, bone conduction can be used to diagnose dizziness. Sabine together with Myrthe Hol, who is ENT surgeon at Radboud University Medical Center, Nijmegen in the Netherlands, focusing on otology with particular attention to titanium temporal bone implants and auricular reconstruction/prosthesis. There has been a long history of collaboration between the Chalmers and Nijmegen groups, and lately especially between Reinfeldt and Hol with joint projects and co-supervision of a PhD student. – Bone conduction has been used before, but not in clinical practice, since today’s bone conduction transducers cannot produce the level needed at the frequency of interest. With a new transducer, which is still a prototype, our preliminary tests show that more patient groups can be diagnosed, and the new method would be more comfortable for the patients. I see several research areas within balance, dizziness and hearing diagnostics where we can contribute with our competence.